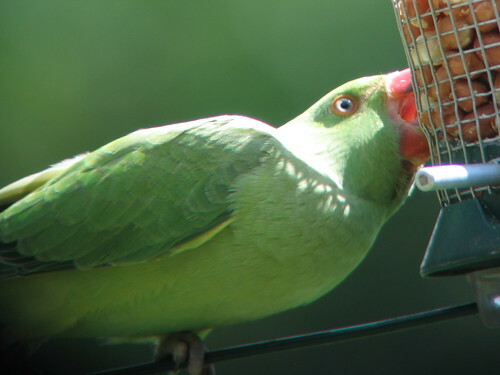 The parakeets only reached this part of London about three years ago, but now we have flocks of them every day; there are often seven or eight on the feeders and more in the surrounding trees. They’re attractive and full of character, but as ever with foreign species you worry about their impact on the native birds; they must be competing for nest-sites if nothing else. 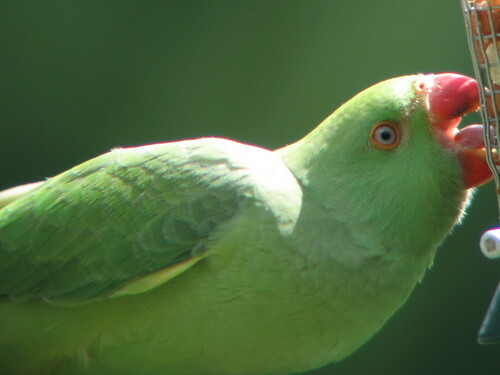 Funny – we rarely think about urban parakeet and parrot populations as a problem over here, because their main competitors, English sparrows and European starlings, are also of course non-native. I don’t know if there’s actually any clear evidence one way or the other whether they are detrimental to the native birds, but these days it seems to be the working assumption that any non-native species is a problem. Meanwhile the cockney sparras are worryingly in decline: I haven’t seen one within ten minutes walk of here for perhaps eight or nine years, and they used to be very common. 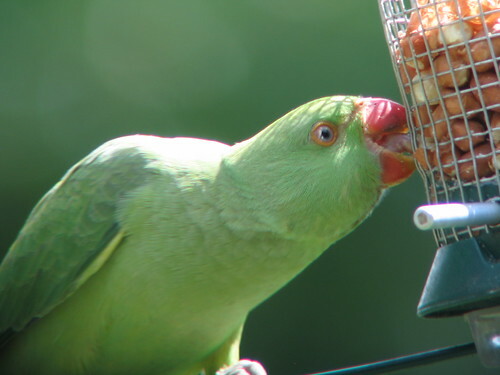 But them going predates the parakeets arriving. Off the top of my head, the only other bird species in the garden that wouldn’t have been here a million years ago is the town pigeon, which is native to the UK but originally lived on sea cliffs. Oh and Canada geese, which aren’t often in the garden but are common in the area. Of course house sparrows are completely tied to human habitation, so they may well have come here with Homo sapiens, but god knows how long ago. On the mammal front, the (American) grey squirrels are a C19th introduction, and I think the brown rat only got here in the C18th.